A few years back I was delivering one of my first professional conference papers, entitled "Domesticating the Last Frontier," when an audience member earnestly questioned, what was the last frontier? I said, "Alaska." In turn the scholar replied, "Oh, you mean Palin-ville," shaking their head and causing a slight round of laughter across the room. The scholar was of course referring to Sarah Palin, who at the time, served as the governor of Alaska. The essay I was presenting was about the construction of Alaska as a "wilderness" that the nation would over time come to "domesticate" through settlement, a process displacing Native communities. The presentation had little to do with the polarizing figure so to stay on topic I shrugged and read the essay. Years later upon recounting this antidote to the Director of the American Indian Studies program at UIUC (giving credit to where it is due) at the time, he suggested that when people ask me about the former governor I should tell them I'm not a "Palin-tologist." This one-liner proves one of my favorite jokes and could be useful for any scholar active in Alaska Native studies. The greater public grew all too familiar with Sarah Palin in the 2008 presidential campaign when she acted as vice-presidential running-mate in John McCain's bid for president. I was busily composing a dissertation as the events unfolded and grew as bewildered as anyone else to the campaign's eerie journey. Please forgive me, but I would like to use an interview segment of one of Palin's many and infamous moments to draw out the issue of border studies and Alaska Natives. If you are faint of heart and the clip is too much, let me explain that during an ABC television interview Sarah Palin claimed that, "You can actually see Russia from land here in Alaska." This assertion made the American public uproar with criticism. 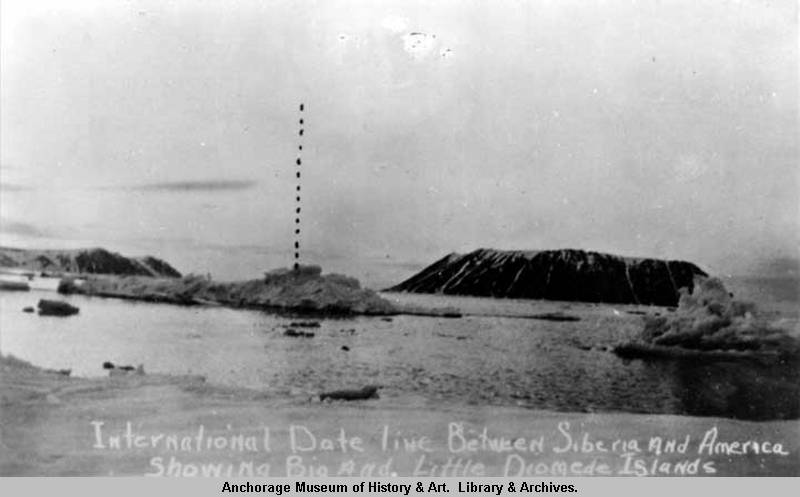 Below is a photo of the governmental demarcation between Alaska and Siberia that also acts as the international dateline. One international border adjacent to Alaska consists of a maritime division with Russia while the other to the east, trails across the continent forming a division between Alaska and Canada. This political map above displays the two demarcations. The graphic additionally leaves one unable to see how the international dateline divides the Aleutian Chain islands under both Russian and U.S. jurisdictions. In contrast, the Alaska Native language map below reveals the trans-Bering and transnational aspect of "Alaska Native" culture. 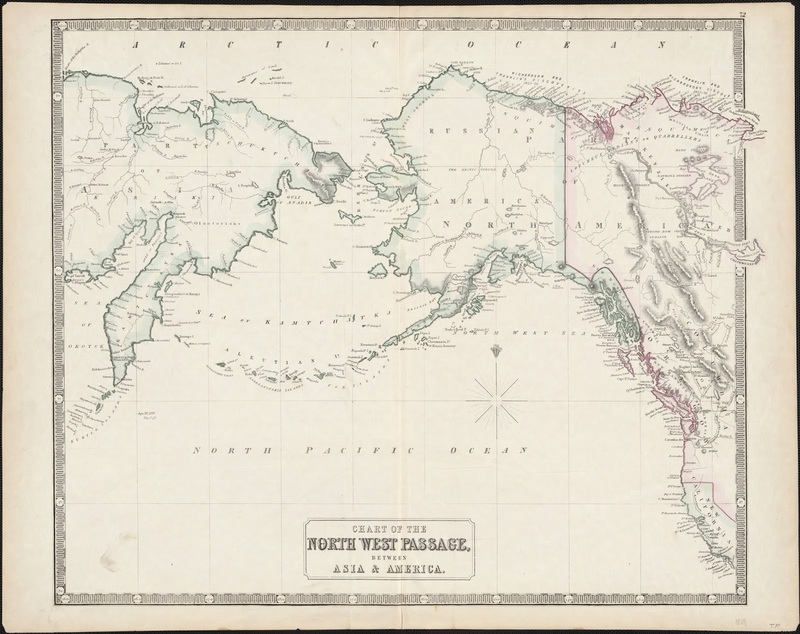 Reading the map, Siberian Yupik and "Aleut" folks possess cultures that extend across the international dateline to the west. The Inupiaq and the inland indigenous cultures, as well as the southeastern groups articulate over the border to Canada. During the presidential campaign the discussion of the governor's ability to see Russia concerned her foreign policy experience. After this initial comment she continued making statements to the press about military air patrols guarding the nation's most western border, keeping the nation safe. 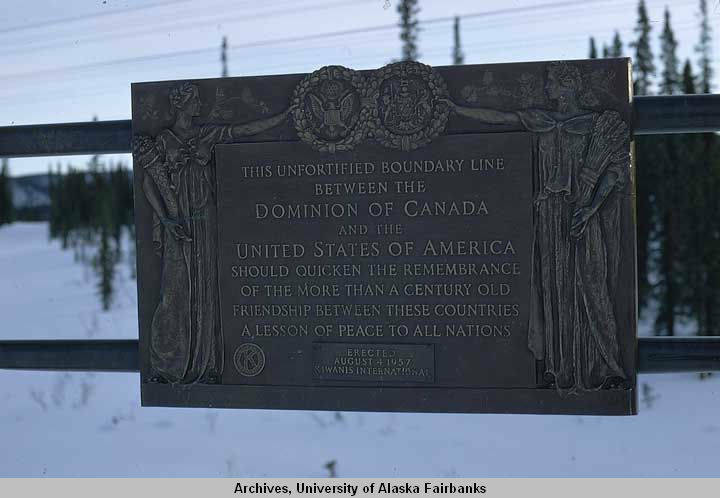 In contrast, the plaque above makes visible an issue Alaska Natives studies shares with those who have interests in Mexican-U.S. border studies, the militaristic border between Alaska and Russia in comparison to the "unfortified" border between the state and Canada. This low-intensity conflict with Russia grew from the rise of the Cold War, after the region became fortified amid World War II. Many communities became divided as the the nation strengthened the border to Russia. In contrast to the eastern border with Canada which is less invested in such enterprise. 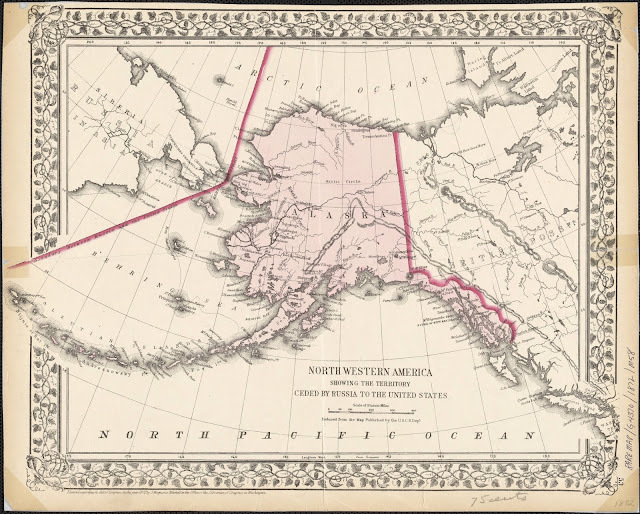 The international dateline came into existence with the Alaska Purchase. leaving a reasonable amount of work that can be done exploring various issues involving Alaska Native border studies. Recent developments along the Mexican-U.S. border have many members of the public questioning if the use of drones to patrol the border is good idea. I'm unsure if drones are being used along the U.S.-Russian border but the link below leads to a discussion about the use of drones in the Arctic. And this video clip discusses they can monitor the Trans-Alaska pipeline.